In the reading selection that follows, from the second half of Chap. 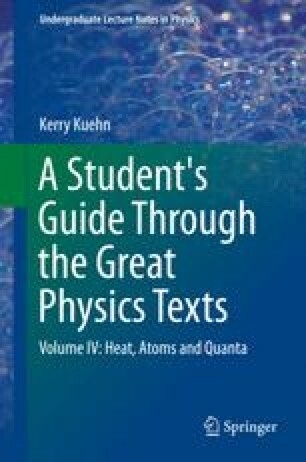 22, Maxwell develops the kinetic theory in more detail, explaining how it may be used to understand material properties (such as the viscosity and specific heat capacity of a gas) and natural processes (such as diffusion, evaporation and electrolysis). Perhaps most interestingly, near the end of this chapter, he introduces what is now referred to as “Maxwell’s Demon,” a tiny intelligent being which seemingly has the ability to violate the second law of thermodynamics. Does it? Also, in the final part of this chapter,Maxwell considers the broader implications of accepting the molecular theory of matter. To what surprising conclusion is he led? Do you agree with Maxwell’s conclusion? The exact equality of each molecule to all others of the same kind gives it, as Sir John Herschel has well said, the essential character of a manufactured article.